Explore whether or not having a senior parent move in with you is a good option. Do any of your siblings, or you yourself, have sufficient space? If setting aside a room for Dad will result in rearranging your children’s own rooms, such as doubling up to share a room or leading to the need for someone to sleep on the couch, it’s important to weigh this disruption against the benefits to your older loved one. Will home alterations be necessary? Assess each person’s home who may be considering moving Dad in, and try to see it through the eyes of an older adult. Are walking areas clear between the older person’s bedroom, bathroom, kitchen, etc.? Are there any fall risks, such as unsecured throw rugs? Will extra safety measures need to be taken, such as installing grab bars, a raised toilet seat, or other home medical equipment? Are there steps to deal with? Is the home wheelchair-accessible? Will someone be home during the day? Social isolation and the risks inherent with a senior being alone will still be a concern if the other adults in the home are away for extended periods of time for work. Is each family member completely on board with the decision? 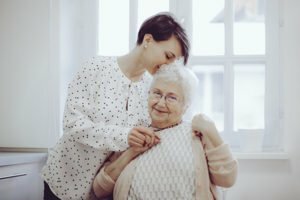 Although you may be fully committed to your aging parent’s new living arrangements, resentment or reluctance on the part of your spouse can lead to tension and relationship problems. Make sure each of your siblings who is considering providing care talks through the situation fully and openly with the other adults in the home before moving the senior in. Are you prepared to handle increasing care needs? While Dad may need just a little extra support now, disease progression and the normal frailties associated with aging will advance the level of care needed over time. Consider such potential scenarios as incontinence, bathing difficulties, wandering, and falls. One other crucial point to think about is the impact that giving up status as “head of the household” may cause, as this can be incredibly difficult for some older adults. It will take some thoughtful planning to determine how to best help the older person maintain dignity, independence and a sense of control. If you and your brothers/sisters are unsure about your ability to provide the best care for your senior loved one, another alternative that may be best for both the senior and your family is the addition of an in-home care provider, such as Hired Hands Homecare. Our skilled caregivers partner with families to help seniors remain safe and thriving in their homes – whether that requires just a few hours each week of companionship to improve socialization, personal care assistance for safe bathing and dressing, help with housework and meal preparation, or 24/7, live-in care. We provide a free in-home consultation to learn more about the senior and to recommend a plan of care to address all concerns. Call on Hired Hands Homecare, the top home care company Santa Rosa CA seniors rely on, at (866) 940-4343 to learn more.